First impressions are critical, especially in the corporate world. When you present a business report, the cover page is the first thing that is seen by your reader, typically right before the table of contents. For this reason, it is important to create a cover design that is clean, professional, and appropriate for the subject matter. The text within the report cover page should also be displayed in a conservative font type that is mostly free of embellishments, abnormal curvatures, and otherwise unusual designs. Unless one of the other fonts has a design that fits perfectly with your logo or the nature of your report, it is generally best to stick with either Times New Roman or Sans Serif fonts. Times New Roman is an ultra-conservative font that is widely used in the corporate world because it is considered very readable. Sans Serif (meaning “without Serif”) refers to several fairly conservative font styles. Some of the most popular Sans Serif fonts for business include Calibri and Arial. Very simple basic corporate cover page. Style: As mentioned earlier, the cover page should be a reflection of what is inside the document. For example, if it is an annual financial report, you would probably want to stick with something clean and professional. On the other hand, if you are preparing a research report about climate science, you may want to include more color and flare. Images: Choose images that complement the report cover page design. For a corporate annual report, the company logo may be all you need. For a scientific research report, you may want to add a flashier cover image, such as a globe, body of water, or nature scene. Brand: The cover page of your report should have a style, color scheme, and font type that are consistent with your company brand. Any images you add should also be consistent with your corporate identity. 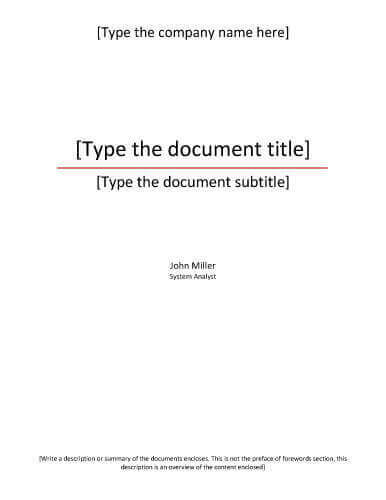 Title/Subtitle: Your report title and subtitle (if you have one) should be compelling and grab the reader’s attention, making them want to dive deeper into the body of the report. Layout: The layout design of the report cover page is where you bring all the elements together. The colors, images, and text should blend together seamlessly to produce a professional and attractive design. Microsoft Word comes with several pre-formatted cover page templates; the exact number varies depending on which version of Word you have. 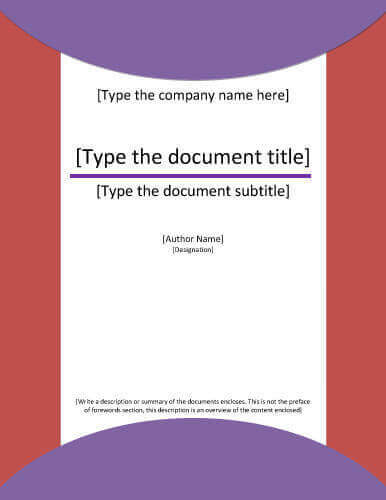 If you are good with design, you can utilize one of the templates within Word as a starting point to develop the cover page for your business report. To add a cover to your document, go to Insert > Cover Page, then pick from one of built-in examples. Our cover page gallery below contains templates with very formal and professional designs. 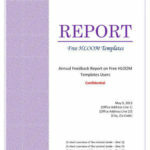 Each report cover page template is designed using Microsoft Word with U.S. letter size. If you are in Europe, you can easily change the page size to A4. If you are looking for a template that is less formal, feel free to check out our other free cover report templates (APA format, creative designs, and more). Word document for financial report cover, blue color theme. Generic report cover template with multi-purpose flexible corporate design. Neutral formal corporate cover layout. The color of blue sidebar can be easily changed to match your corporate style. Research report cover sample idea with curvy design element for report header. Geometrical simple design with half-circles in the header and footer.